​This company was organized September 12th, 1828. Their apparatus was the double decker owned by the Phoenix Manufacturing Co., and during the brief (14 year) existence of the company they were quartered in a two-story frame building on the south side of Boudinot (later called Van Houten) street. Their machine, seen below, was the only double-decker apparatus ever in service in Paterson, and the membership, as a rule, was composed of persons in the employ of the Phoenix Corporation. The term double decker is explained as follows: Look closely at the etching below: notice what looks like slabs of wood on the top surface of the water tank above the front and rear wheels. They are actually foldouts (like leafs on a table) on which firemen would stand as they lifted and pushed down on the side arms (called brakes) that extend from the pumping cylinder. Those arms are quite long so in this type of apparatus some men also stood on the ground and did their "pumping." So with men on the ground and on the "deck" of the engine the term double deck was used. On every other Paterson hand pumper, men stood on the ground to use the arms (brakes). Each member was provided with a white duck coat which hung on a peg in the engine house. The question of who was to pay sundry hills incurred by the company was the cause of frequent debates at meetings of the fire wardens, and finally, on August 11th, 1842, the wardens notified the company that their services were no longer needed, and their connection with the fire department of the town of Paterson was severed. When a new goose-neck engine was purchased for Neptune No. 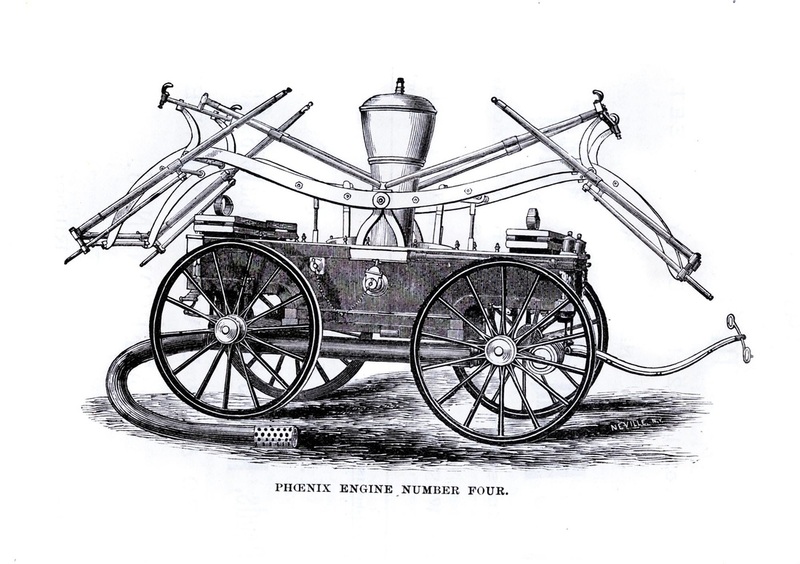 2, in the spring of 1840, their old engine was placed in charge of a new company which was stationed at the corner of Broadway and Mulberry streets. The company was short-lived, never having over thirteen members, and they were disbanded December 6, 1842. This company was instituted in 1868 and was composed of residents of Totowa, and their engine was the Smith machine previously used by Washington Engine No. 3 at the time the latter company's Jeffers steamer came (circa 1863). They were quartered in a one-story frame building at the corner of Sheridan Avenue and Henry street. The company was soon disbanded. Their last appearance in public was on a Saturday afternoon, when they took their engine to "Molly Ann's" brook for a "wash" and left her there.